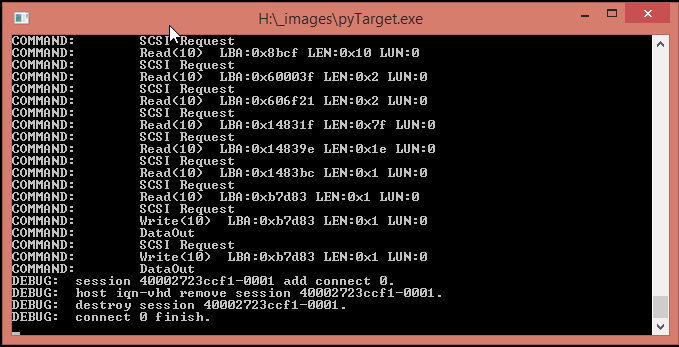 Writing this on a SAN Booted Windows 8.1 - booted from an pyTarget Target. Client IQN must be specified in the pyTarget configuration file or SANHOOK/SANBOOT will fail. 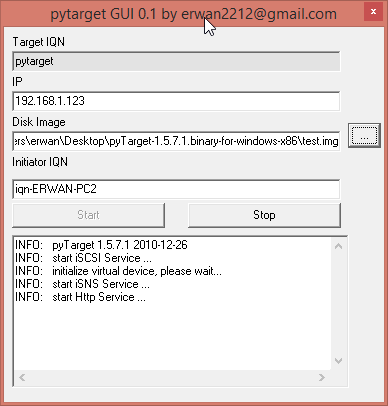 Use iPXE set initiator-iqn command to set Client IQN to the same name as the IQN specified in the pyTarget config file. Did I mention that pyTarget seems to be portable and lightweight - it's only 5 MiB in size. It's possible that 1 unit is a disk sector - 2048 x 512 byte sectors would equal 1 MB. It would be interesting to see how the same command runs on a 4k sector disk. If the Target disk does not exist, it will be created as a raw file with path and size specified in the config file. Would you want a GUI may be? Something coded in delphi, portable? Sounds great. Was this a spontaneous offer (having perhaps not read properly post #1), or did you in fact take the bait? Getting an error for now with pytarget. I use iscsi in many situations and having a portable/free iscsi target would be great. I need to sort out the error I am getting before I initiate a GUI (socket error...). I don't think it likes VHD files. Haven't tested properly, but I'm guessing that the 1 sector header on fixed VHD's is mounted along with the rest of the file - this is purely conjecture at this point. P.s. If the disk image is in the same directory as the exe then the path can be omitted - handy for portable operation(s). 256*1024*1024 * 2 = 536870912. ...this appears to be due to a conflict if a webserver is running on port 80 (e.g. TPS). Doesn't appear to effect functionality, however web console will not be working. I have a new error now which is more "cryptic". My disk is 256MB = 262144KB. Multiply by 2 and I get the right capacity i.e 524288. P.s. Just tried a fixed VHD as target. Created the VHD on my server using DiskPart - partitioned, formatted, etc. Connected from a Windows 7 PC (not SAN boot - just connected as storage) - it mounted the single partition without any problems. A quick and dirty GUI here. Eventually update the textboxes : IQN and listening IP. Click GO and select an image file. It will generate a config.xml file. edit : link fixed as dropbox is letting me down. Just for the record, there is NO 1 sector header in fixed VHD, there is a 1 sector footer (the CONECTIX descriptor sector) appended to the RAW image. Thanks for the info. I couldn't recall if it was a header, or footer, or both! Due to other commitments and an ability to get easily distracted, I have had to limit my experiments with VHD files. I have a guide to update - a guide I seem to recall you volunteering me for!!! though I reserve all rights to do so in the future. And yes, I just took note that I might need a special permission from you know who , that would be - I guess - the most tricky part . The exe will generate the config.xml and launch pytarget while displaying the output in the memo box. The exe needs to be in the same folder as pytarget.exe. It looks beautiful in it's simplicity! I'm not in a position to test this evening as I'm off out to bid farewell to a colleague. Will test as soon as I have the opportunity and will feedback. I can boot windows 7 thru iscsi but end up with a 0x7b. I have disabled LWF (see here), and forced services (nic and msiscsi) to start=0, disabled firewall, deleted the disk id to force rediscovery at next reboot ... but no success so far. Enabling debugging, i get the below. 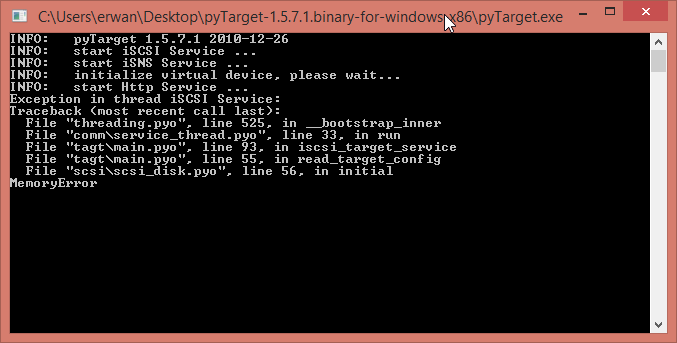 Attempted to install Windows 7 (SP1 - 32-bit) directly to a pyTarget Target - it failed to boot during stage 2 (the first reboot after running setup.exe). A windows 7 disk created with a different Target software (Kernsafe iStorage Server) booted ok when moved to pytarget. Haven't got a clue what's happening. P.s. I haven't tried cloning Windows 7 to a pyTarget Target. EDIT - I just happened to have an AoE disk cloned from a Windows 2008 R2 SP1 system lying around - mounted this in pyTarget - it took ages to complete the first boot and then prompted to reboot on reaching the desktop - seemed fine on reboot.